Philosophical Transactions of the Royal Society B: Biological Sciences is a biweekly peer-reviewed scientific journal published by the Royal Society. The editor-in-chief is John Pickett (Rothamsted Research). Each issue covers a specific area of the biological sciences. Each issue aims to create an original and authoritative synthesis, often bridging traditional disciplines, which showcases current developments and provides a foundation for future research, applications and policy decisions. Each issue is edited by one or more expert guest editors. All articles become freely accessible one year after their publication date. 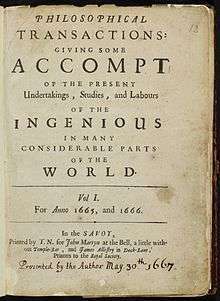 Philosophical Transactions of the Royal Society was established in 1665 by the Royal Society and is the oldest scientific journal in the English-speaking world. Henry Oldenburg was appointed as the first (joint) secretary to the society and he was also the first editor of the society's journal. In 1887 the journal expanded to become two separate publications, one serving the physical sciences, Philosophical Transactions of the Royal Society A: Physical, Mathematical and Engineering Sciences, and the other focusing on the life sciences, Philosophical Transactions of the Royal Society B: Biological Sciences. Nowadays, both journals publish themed issues and discussion meeting issues, while individual research articles are published in the sister journal Proceedings of the Royal Society. The journal celebrated its 350th anniversary in 2015. To commemorate this event it published a special collection of commentaries on landmark papers from the archive by scientists such as Antonie van Leeuwenhoek, Hans Sloane and Alan Turing. ↑ Pickett, John (4 January 2016). "Editorial: Comments from the new Editor". Phil. Trans. R. Soc. B. 371 (1687). doi:10.1098/rstb.2015.0470. ↑ Philosophical Transactions: 350 years of publishing at the Royal Society (1665 – 2015) (PDF). The Royal Society. ↑ "Celebrating 350 years of Philosophical Transactions: life sciences papers". Phil. Trans. R. Soc. B. 370 (1666). 6 March 2015.